The Dutch term "autoluwe" refers to any place with few cars. There is no translation in regular use in English but I think we need one. I propose "Nearly Car Free" or NCF or a way of describing these areas. It's perhaps a little cumbersome, but it's descriptive and difficult to distort its meaning. Woonerven (Home Zones) are Nearly Car Free but woonerven are residential areas. Shopping streets do not have the same character. While woonerven are not through routes by either car or bicycle and serve only those who live in the area, shopping streets have to allow access by the public. Shopping streets should not have the same form as a residential area. The idea of Autoluwte goes back to the 1970s and it is common in very many town centres and smaller shopping areas across the entire country. Every town and city has areas like this and the centres of Assen and Groningen are not exceptions. In the centre of Assen everyone cycles in safety. If you don't watch this video then you will probably not understand the blog post. Nearly car-free streets like this feature all across the Netherlands. They're a great success. Note that anti-pedestrian chain railings were once installed on streets like this in the Netherlands in order to prevent pedestrians from crossing the road where it was most convenient to do so. They're gone now. Pedestrians can now cross at any point on a street which is no longer designed for the maximum convenience of motor vehicles. Almost all city centres in The Netherlands work in this way. Some streets are only for pedestrians, many allow cycling for access, those where automobiles are allowed are usually not useful as through routes. Groningen also has nearly car free streets. As in Assen, this means that even small children can ride, and crash, their own bikes in the centre of the city, safely isolated from the danger of cars. This is not "Shared Space"
Unfortunately, foreign observers often confuse NCF with the much newer, but much less successful idea called "Shared Space". This is unfortunate as they are actually diametrically opposed ideas. While NCF removes motor vehicles in order to make cycling and walking more pleasant (an example of unravelling of routes), "Shared Space" seeks to achieve the same ends while keeping motor vehicle through traffic and forcing motorists, cyclists and pedestrians to "share" the streets on an equal footing. Simply because architectural features of the space have been changed, drivers are expected to behave in an unusually friendly manner towards pedestrians and cyclists for eternity. Those same architectural features are also supposed to give pedestrians and cyclists more confidence to make their way as vulnerable road users amongst a large volume of motorized traffic. This is of course ludicrous and it does not work. The Netherlands was the first to come up with the idea of Shared Space, but it is not popular here now. "Shared Spaces" in this country date from the early 2000s when the idea had its brief popularity and before people had seen the problems with it. They have been retrofitted with features such as pedestrian crossings, railings and signs because of course it turned out they were necessary in order that people would be able to do such things as cross the road. In "Shared Space" areas, pedestrians run across the road and cyclists cycle amongst the pedestrians. Such areas do not have relaxing and pleasant streets as seen above in Assen and the many other places which have excluded cars. Removing cars from streets is a very effective way of encouraging cyclists. However, this removal has to be almost total in order to make cycling attractive to the whole population. Note also that "pedestrianized" areas in the Netherlands usually make it clear that they do not exclude bicycles. We are running an open Cycling Study Tour in May 2013. Book a place if you wish to see how what we describe on this blog works in real life. Well before it was applied to streets in the Netherlands, the underlying principle of Shared Space was laid out very clearly by the Danish author Hans Christian Andersen. Exaggeration considered harmful. Hiding the real story about cycling. 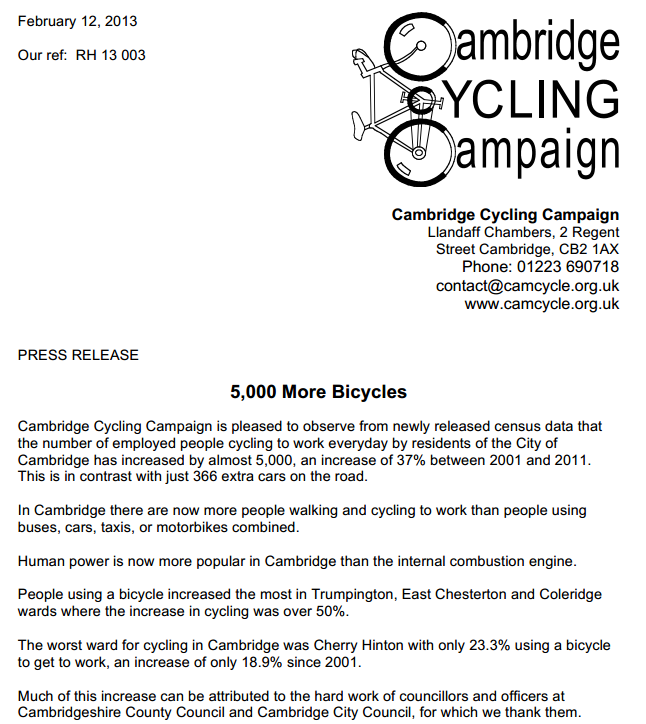 I just received a rather triumphant press release from Cambridge Cycling Campaign. It's a "good news story" about "5000 more bicycles" which I expect will be reported verbatim elsewhere. However as an ex resident of the city it instantly rang bells for me and I think it deserves a little analysis before blindly reproducing the claims. 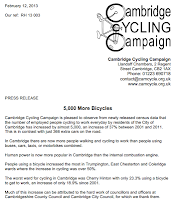 The central claim is that there has been an increase of 37% of "employed people cycling to work everyday by residents of the City of Cambridge" between 2001 and 2011. There is also a claim that there are "now more people walking and cycling to work than people using buses, cars, taxis, or motorbikes combined", that the worst performing ward of Cambridge is Cherry Hinton with a "Percentage of residents cycling to work" of 23.3% while the best performing is Newnham with 40.6%. They also pointed out that "the rates of bicycle use may be under-representative of the actual bicycle use", suggesting that both the high rate of student cycling and multi-modal commutes both meant that these figures were underestimates. The reader is to assume that the actual cycling rate in the city is somewhat higher than these already high figures, based on nothing but a suggestion. an island in this view. It all sounds amazing. But can be we believe these figures ? I think not. Cambridge certainly has the highest cycling modal share in the UK. That is supported by many published figures and Cambridge stands out as an island on the Guardian's visualisation of the census data. Cambridge almost certainly also has the highest cycling modal share of any city across the English speaking world (I've discussed some of the reasons why). I like the city a lot. We lived there for nearly 20 years in large part because of the cycling, which is somewhat ahead of the rest of the UK. However, this exaggeration is painting a false picture of how much cycling there actually is in the city. I believe the figures are based on British Government 2011 census stats published a few days ago. These were summarised quite nice with an interactive map overlay on the Guardian website. Cambridge achieved the highest figure for cycling with 18.1% of people saying that cycling is the main way that they commute to work. It is important to note the source of these figures. They come not from traffic counts or observations of actual behaviour of commuters but from a survey question which asked about "the main way people commute to work". Any such survey is open to Response Bias - a tendency for people to give the answer that they think the questioner wants to hear. Such surveys are also quite open to people's own interpretations of how they think they travel. i.e. "Cyclists" are likely to say that they cycle even if they do so only two days a week on average. There are many causes of error in survey results, and while with care we can compare one survey with another taken at the same place on the same date of a different year, any comparison with different dates, different places or with the result of an analysis of behaviour measured in a different manner is at the very least to make some dangerous assumptions. The press release combined "walking and cycling" as that made the figures sound more exciting than they actually were by adding the 9.6% of people who self-reported as walking to work to the 18.1% who said that they cycle. Note also that the 3% of people who said they used the train to get to work, 0.2% who said they used a coach and 0.1% who say they use light rail have been excluded from the comparison group of "buses, cars, taxis and motorbikes". That's how it was made possible to claim that cycling and walking combined were "more popular in Cambridge than the internal combustion engine." invisible island in this view. However, we must note that when we look at the raw stats on the Guardian site show that many places all the way across the UK, including just on the edge of Cambridge achieve a figure of between 45% and 60% of commutes by car without excluding anyone. The most extreme have between 60% and 75% by car, with one of these appearing just a few miles from Cambridge, and that's without anyone having to cook the books to make the numbers appear higher. Cycling remains a minority pursuit across the UK. This press release was not the first example of exaggeration that I'd seen based on the same survey results. In fact, it took only a couple of days after their publication for the cycle of exaggeration to begin. A Cambridge politician excluded some of the groups used in the original report in order to report that "nearly 32% of those who travel to work in Cambridge get there by bicycle". This is presumably the reason for the peculiarly precise language used in the press release ("the number of employed people cycling to work everyday by residents of the City of Cambridge"). The more people we remove from the comparison, the more meaningless it becomes because each time we remove people we remove information. If we were to continue the process of removing groups of people who do not cycle, then we would end up reporting merely that 100% of cyclists ride bikes, which of course is a meaningless statement. Now I have to note that it's rather self-serving for a politician to say this. Politicians have a long history of claiming to be working for cycling while in reality they spend far too little on cycling infrastructure. This is certainly true within Cambridge. The press release goes on to say that "Much of this increase can be attributed to the hard work of councillors and officers at Cambridgeshire County Council and Cambridge City Council, for which we thank them." and that "Cambridge has grown with virtually no additional motorcar traffic because of the money spent on cycling." when in fact, the investment in Cycling within Cambridge has for a very long time been a tiny fraction of that spent to benefit motorists. Indeed, it's not many years ago that the Cambridge Cycling Campaign itself pointed out that the expenditure on "cycleways, footpaths and safe routes to school combined" was just 0.6% of the local transport budget. When I wrote an introduction to an article printed in their newsletter I pointed out that local expenditure amounted to just "£1.45 per person per year". Unfortunately, Cambridge Cycling Campaign now seems to have joined with the council in their attempts to exaggerate the achievements of the city. It is a mystery to me why a campaign group which has watched remarkably little progress occur for nearly two decades should have decided to help the very politicians who have done so little for cyclists. To do this provides no basis for future campaigning. If everything's fine already, why even bother with campaigning ? This is not the first time that false statements have been made about Cambridge. In the 1990s, one of the councils in Cambridge published a leaflet which described Cambridge as "the second best city in the world in which to cycle after Amsterdam" (or words along those lines). That wasn't true then, and this isn't true now. Of course, Cambridge is far from the only place to exaggerate its achievements. Many other places do the same. I've pointed out some of Copenhagen's repeated exaggerations but also found Amsterdam exaggerating the truth. Portland made a similar claim to 1990s Cambridge when they said they were "only second to Amsterdam". Popular lists of "top cycling cities" regularly present figures which have no basis in fact, which are collected by sufficiently different means that they cannot be compared with one another, or the simply miss out many Dutch cities and this is often done in order to hype one place over another. Of course it takes some effort to find good figures. I've found it difficult to get to the bottom even of many figures published here in the Netherlands. Emails which I've sent asking for the source of figures which apparently contradict each other have gone unanswered. Is anyone actually interested in facts any more ? Is this exaggeration simply a reflection of people liking to be told that where-ever it is that they happen to live is good ? Does anyone want to actually learn from what works elsewhere, or are we all too busy claiming to be number one ? school by bike and who afterwards rode back home. Nothing out the ordinary in this country, but in the UK ? The problem is that this exaggeration is harmful. It is harmful because it prevents progress from being made. If all sets of figures have been "cooked" to some degree then we have absolutely no basis for comparison at all. If figures which are accurate from one place can only be compared with "cooked" figures from another then it makes it very difficult, if not impossible, to work out what works. When figures are exaggerated, no new information is being created. All that happens is that the truth is swamped beneath piles of meaningless press releases. Hiding the facts does not help cyclists, and cycling campaigners do not help their own constituency by boosting their own cities purely for the sake of an impressive press release. For cycling to grow we need to look at the best practice from all around the world, not encourage people to accept the low standards of what they already have. For progress, we have to continue to be critical. Even in the world's genuine top cycling city, campaigners are rightly not satisfied with what they are given if it doesn't result in an ever improving standard. Far too much emphasis on "cycling cities"
even adult commuter cycling drops rapidly to below 5%. ease of cycling between Cambridge and Assen. 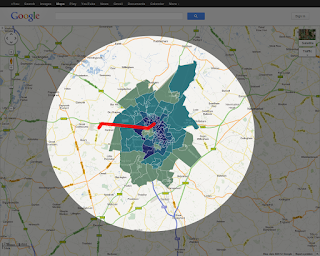 What the data from the Guardian website shows most vividly is just how much of an island Cambridge is. There is an amazingly sharp drop off in cycling as you reach the edge of the city. In most of the surrounding countryside the patterns of transport are the same as the rest of the country. i.e. Very low cycle usage, very high car usage. The idea of "cycling cities" is itself harmful. There is no reason why we should only consider cities, nor why we should expect that people will only cycle in cities, nor why we should be so interested in counting only how much cycling there is in cities, nor how high the figures can be made to look for a subset of cyclists in a small area. That is not how it works in the Netherlands. We don't have cycling cities, but cities, towns and villages in a cycling country. Cycling doesn't drop off at the boundaries of cities but is normal all the way out into the countryside and through all the villages until you reach the next city, where it's also normal. It's normal for secondary school children to commute relatively long distances through the countryside to reach the nearest city where their school is. It's normal for elderly people to go on rides together just because it's a pleasant thing to do. To make these things possible requires a lot more than boastful exaggeration. It requires reliably consistent quality of cycling infrastructure and investment of enough money to do a decent job of a comprehensive cycling network which goes everywhere - this ensuring a sufficient degree of subjective safety that cycling is accessible to everyone. Now I could finish by quoting some spectacularly high figures for cycling in this area, but I won't. If I did, would you believe them ? I hope you would not without taking a close look first. Suffice to say that there is considerably more cycling here by a far wider demographic than exists anywhere in the UK, including in Cambridge. That's covered by the usual unspectacular figure quoted for the whole of the Netherlands: 27% of journeys in the whole country are made by bike, that's for all the people and all their journeys for all reasons. In November 2015, the Cambridge Evening News reported that "there has been a massive 88 per cent increase in cyclists" in an article which was picked up by other sources which point out that "Cambridge already has record cycling participation levels with 20% of trips made by bike". i.e. after the supposed near doubling of cycling in Cambridge, the actual modal share remains at the same figure as I've been quoting for many years. Exaggeration doesn't help now, it didn't help four years ago and it didn't help twenty years ago. What is required in Cambridge is a go everywhere grid of genuinely improved infrastructure, not piecemeal developments combined with many words. The picture above of Cambridge as an island may seem to fly in the face of frequently made claims that Cambridgeshire as a whole has a higher percentage of trips by bike than other counties. However, note that a quarter of the population of Cambridgeshire lives in Cambridge. The bubble in the city therefore makes the whole county appear to have a higher modal share for cycling than is actually the case outside the city of Cambridge itself. the English" by Kate Fox. I don't want to single out the un-named Cambridge politician involved in cooking the figures above as he's no better or worse than the rest of them and I found him quite agreeable in person. However, I will point out that for several years I made a point of inviting all of them, including him, to accompany me on Study Tours in the Netherlands so that they could see for themselves how it is that Cambridge falls short of the standards of the Netherlands. Unfortunately, while many of them replied to let me know that they were "interested", every one of them sadly turned out not to have a gap in their busy agendas on any of the dates that I'd planned. Unfortunately, it also turned out that not one of them could make it on a date of their own choosing or even at my expense. Politicial commitment to cycling clearly only goes so far. I direct much the same sentiment towards the Cambridge Cycling Campaign. They're a good bunch of people who I again largely know personally. However their aspirations remain far too low for what is possible in their city and they are too easily led by the local politicians. The Campaign has now been in existence for seventeen years. That's the same period of time as it took for the whole of the Netherlands to get from Stop de Kindermoord to a very good standard of infrastructure. Cambridge has not made the same transformation over the same period of time. "Second to Amsterdam" is a remarkably lazy claim which demonstrates the lack of knowledge of those who would claim it. Amsterdam may be ahead of places outside of this country but it's certainly not "the best" place in the Netherlands. For a start, rates of school cycling are lower in Amsterdam than in other Dutch cities. There's a Dutch saying "Meten is weten". Translated into English this means "Measuring is knowing". The principle is sound: unless you have reliable measurements, you don't really know anything. Read more blog posts about Cambridge. It snowed on and off today. This didn't stop me riding to the post office to send customers' parcels on their way. As you'll see from the video, it actually didn't stop many people doing what they normally do by bike. If you wind through to 2:35 on the video you'll see what the city centre looks like on a snowy day. Cycling in winter is something that is normal here for everyone, not just an unusual activity for extreme sports enthusiasts.